Snoek and Iggie a nice match for early winter. Well its the weekend again and as usual the weather is going pear shaped! Saturday has a southerly that will keep us off the water and some swell to fit. So even tho the water is good its going to be tough finding a dive. Last weekend miraculously came right and I got an Iggie and Snoek while looking for bugs. Its a bit strange getting an Iggie this time of the year, and is only my second one at Sheffield. It must have been because I was wearing the new club shirt with new Iggie logo on!! check below!! Maybe there is some thing in the shirt?? That reminds me! Club nite next week is at the Wahoo comp anyway ..... gee you think I am trying to say something?? Anyway moving along quickly Sunday holds some hope for a dive or at very least a good surf. Well the sea was looking good this morning. There was a good swell running and dispite the tide being very high there were still some good waves. And I did not feel too amped to do a big swim in the swell alone ... what a woose!! But I scored some cooking waves and one full stand up barrel across the bay .... nice! There have not been to many reports of fish, either the guys are keeping it quiet or there just arnt any! There looks like there is even more swell on its way and a big south west on Friday nite. So Sunday might be diveable or at least surfable! On the North Coast Surfers Union front we have had 22 members join already!! This is absolutely fantastic news, and means that we will start to get the ball rolling sooner than later and effect some change on our coast. Hey guys well the sea has been playing ball and there has been some diving all along our coast. There are still reports of snoek coming out, I heard that the La Mercy & Westbrook / Tongaat streach was very productive on the weekend. This has to be one of the best snoek seasons we have had in years, I know loads of old times who are saying that this is as good as they have ever got it. Anyway its good to have the snoek here!! I have also heard reports of the odd Garrick been sighted or shot up our way. So they are on their way, and I am sure this will provid some excitment in the shallows. Well,with last week being a write-off with (November type North -easters), the swell finally flattened off a bit from this consistent 2m stuff (either i`m getting too old to swim it or its global warming effecting the swell size!) to 1-1,5m friday though with the low spring over the weekend it still made a hazardous swim over the sandbanks with only 1ft of water to clear!! on the low tide. Viz. Hibberdene side between 4-6meter on the inshore reefs and I heard there are now some garrick about. One fine (reportedly) 20 kilo fish was bagged at Ifafa on friday (according to Mike Smith) and two came out off Umzumbe Saturday and there are small-medium size snoek about. the few divers i spoke to got their bug quotas as it flattened out nicely yesterday on the high spring tide though the viz was still too poor to spot any snoek or garrick. hopefully we get some good conditions now for June and July. Just to let would be divers planning a dive down this side that car break-ins are out of hand, mine was broken into right outside my girlfriends place last week (i wasn`t even out diving) and it`s almost a guarentee if you are parked anywhere other than the main bathing beaches,someone should set a trap for these bastards as the cops and two security Co`s in this area dont seem to do s...t about the problem. Finally we are trying to get our act together. Instead of just sitting on the beach and bitching about all the issues, we are getting our act together!! If you are a surfer on the North Coast and live here pay rates and use the beach ... you have rights and a should have a say on what happens at your beach. Unfortunately when you stand alone no one listens or takes you seriously. The North Coast Surfers Union is not a club, its a forum were we stand together and voice our concerns and opinions. We we can motivate and even action change on our beaches. And most of all preserve the beauty of our coast line. I want to to challenge you if you live and surf on the north coast and choose not to get involved well then you are saying you don't care!!! All you need to do is sign up on the Web Site North Coast Surfers Union. Guys lets support this, get the word out. This will mean that you will be able to have your say and keep informed on whats going on. Sorry I have been elusive on the blogging front. I have had my head in a whole trying to get the finishing touches to the Spearfishing DVD. Its going really well and we have put everything into this film to make it really beyond what is presently out there in the spearfishing market .... but you will have to wait to see it for your self ...very soon. I have not been diving much ..as I said busy busy busy!! the guys got in yesturday and it was nice and clean, but the fish were very scarce. The swell picked up in the afternoon and we though that we were going to get cooking surf this morning. This want to be as the north wind blew all night and made the swell all wobbely. I check it earloy and almost got in .. but the landed up getting to the office early to get ontop of things this side. Other than the shoal I have not heard of fish coming out, traditionaly this is when Hiberdene starts to work .. so if you hear of anything let me know. Just a little heads up - Salty Divers Club meet week after next will be a the Wahoo Comp at Vidal. Some of us will already be there so why not make it a double whammy and come through. All good I hope the clean water holds out till the weekend. Jon Cooper took this underwater photo of these three Sharks on Aliwal Shoal this week. The conditions on Aliwal Shoal have been epic, and this photo of these sharks is proof enough. I think this pic is an award winner if I ever saw one ... absolutly amazing!! 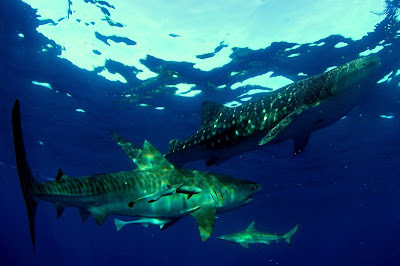 I mean a Tiger shark, Whale shark and a Black tip shark in the same pic in near perfect composition. How is this for diving?? Imagine having this ability and spearing ... it would just be unfair!! William Trubridge broke the world record in Unnasisted Freediving (Constant Weight No Fins - the purest expression of freediving) with a dive to 88m (288ft) in 3 minutes 30 seconds. This was at the Vertical Blue 2009 Invitational Freediving competition, held at Dean's Blue Hole, on Long Island in the Bahama between April 1-11. Check out this Vid or Click Here if it does not come up. I think this is mind blowing ....dont you think?? 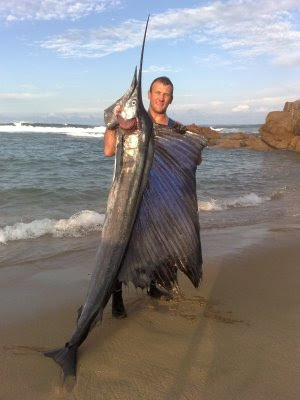 Sean O'Connor Epic Sailfish shot at South African Nationals Spearfishing Champs. 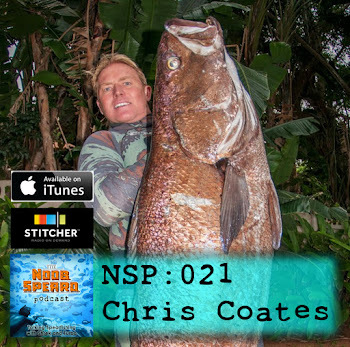 While every one else at the South African National Spearfishing Champs was shooting aquarium fish Sean did the North Coast boys proud and and showed the boys what a real fish looks like. Spearfishing in autumn can be very fustrating on the north coast, the shoals of cuta have moved south the winter fish are still to come, and worst of all Aliwal cooks! I am a very unluck Aliwal dive I aways seem to catch it the day after or before .... what eva I just miss it. So naturaly I am reluctant to mission down there on a whim. On another note but still down south the Ozzy Spearfishing team KLAPPED the SA boys on their own turf. Ok 2 of the Ozzys were local boys living over in Oz and know the south coast backwards ... but hey a win is a win. On a down note the East looks like its up!! Well atleast for the next few days ... I hope the forcast is exagurated and we get some moderate days with some diving thrown in. The 2009 Wahoo Winter Gamefish Spearfishing Competition. 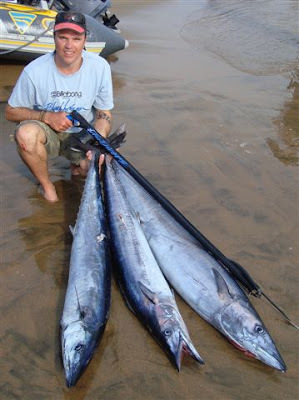 The Wahoo annual Winter Gamefish Spearfishing Competition traditionally held at Cape Vidal has been set for weekend of the 6th June. Like last year there is a limit on boats and entrants. Only 35 boats and 120 competitors will be allowed. 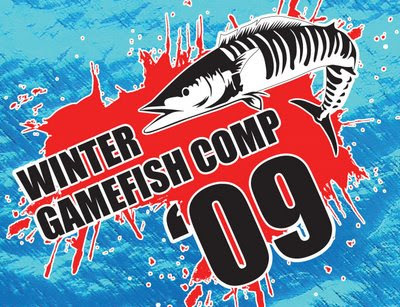 Click this link to download the: Winter Gamefish Spearfishing Competition Entry Form. 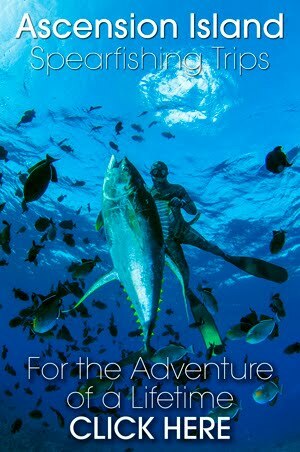 As always this is the Spearfishing Competition not to be missed!!! Braidy gets his 8 Crayfish!